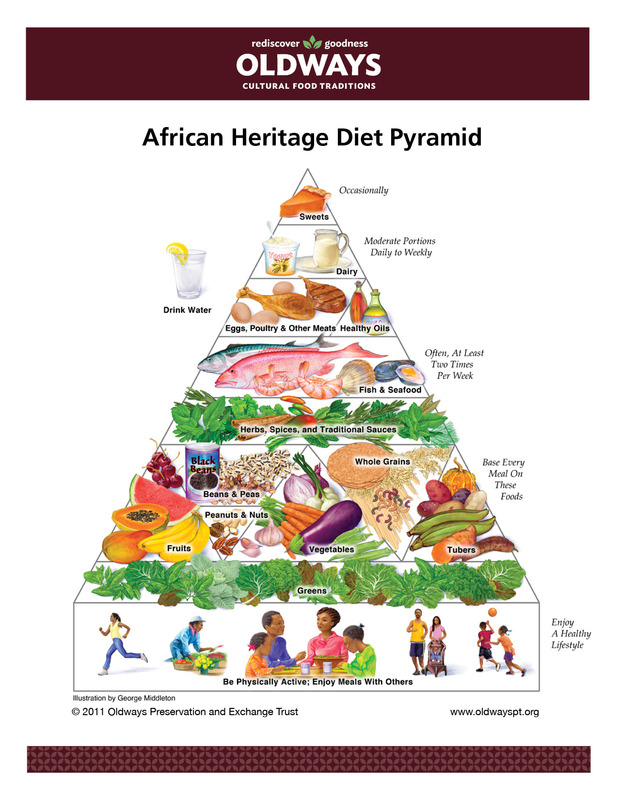 Oldways has created the African Heritage Diet Pyramid with the help and knowledge of experts in African American and African Diasporan history, cuisine, nutrition, and public health. This healthy eating model was designed speciﬁcally for African Americans, and African descendant populations everywhere, to introduce them to their Healthy Heritage. It can also be used by anyone wanting to use heritage as a guide to eating well. The Pyramid celebrates the individual foods and the traditional healthy eating patterns of African Heritage, with roots in America, Africa, the Caribbean, or South America. The foods of African Heritage contain lots to be celebrated, and they begin with the main ingredient of African American cooking today—ﬂavor! Heaps of herbs, spices, and savory sauces jazz up simple, healthful vegetable-focused meals, showing us that “healthy eating” also means great taste. Traditional African Heritage meals are based on an abundance of colorful fruits and vegetables, especially leafy greens; tubers like sweet potatoes; beans of all kinds; nuts and peanuts; rice, ﬂatbreads and other grain foods, especially whole grains; healthy oils; homemade sauces and marinades of herbs and spices; ﬁsh, eggs, poultry and yogurt; and minimal consumption of meat and sweets. Available either as a downloadable PDF (at the PDF link above) or as a pre-printed hard copy. To purchase hard copies of the pyramid card (printed on letter-size 8.5”x11” cardstock), please visit our Oldways store at the link below.